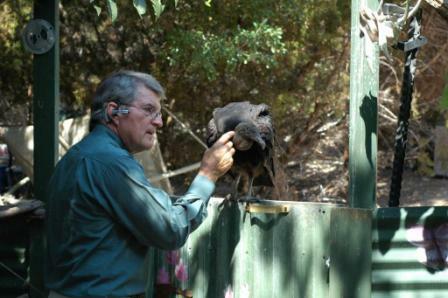 Bruce Deuley and Buffy his black vulture. See Buffy the guitar pickin vulture. 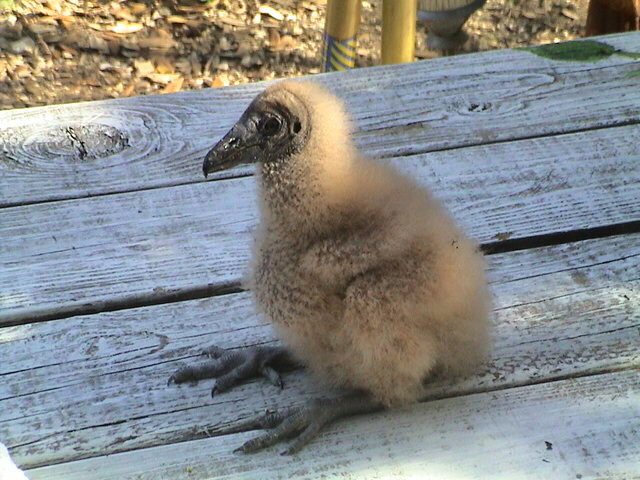 Buffy is a free ranging wild black vulture that frequents my home on many occasions. Her scientific name is Coragyps,atratus Cora meaning Raven, Gyps, Latin for vulture and atratus, translates to “clothed in black as in mourning” , is a perfect name for this interesting and gregarious bird. She has been a frequent visitor since an uniformed hunter killed her parents, which were nesting in his deer blind, when they supposedly “attacked” him and he shot them “in self defense”. In actuality, the deer blind had only one door and when he opened it they fled in the only direction they could. Incidentally, both turkey and black vultures in the U.S. are protected by the migratory bird act and there are heavy fines for killing them without due cause. Buffy often soars over my home along with the other wild vultures in her committee (one of the terms for a group of vultures) but when she sees me coming home, she will frequently break away from the group for a visit. She is totally tame around people, once she gets to know them, but is usually somewhat timid at their first approach. 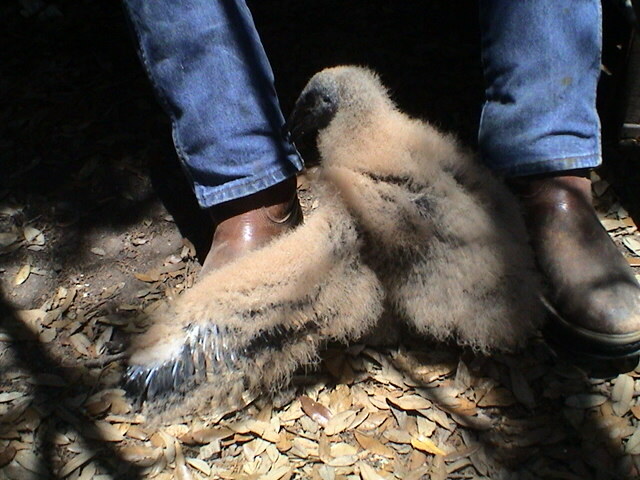 While I have read black vultures are known to harass and even kill small mammals and birds, I have over 100 baby ducklings, a number of young chicks, guinea pigs and bearded dragons, all free ranging in and around my yard and have never seen her make any effort to harm any of them. She even roosts on the ground at night with little chicks and ducklings right around her on many occasions. She will take meat from my hand, if I give it to her, but prefers to disassembly it on her own and is perfectly able to fend for herself in the wild if necessary. I have come often across her out on the highway with her wake (another name for a group of vultures) feeding on an unlucky armadillo or deer and she always comes back to the house full and quite content. I have no idea how long she may keep returning to my home but, this is the third year and it appears I am a regular part of her “committee”. As long as she wants to be a part of the family, the welcome sign will always be hanging on her favorite gate. Howard's Comment: I have met Buffy and she is quite a character. She even gets along (most of the time) with Bruce’s dogs.